Make accurate 3-phase power system measurements (3 voltage, 3 current, neutral and one channel to spare!) 20 MHz bandwidth and 12-bit vertical resolution are ideal for 50/60 Hz power system monitoring and harmonics analysis. Debug multiple low-speed serial buses such as UART, I2C, SPI, 1-Wire, CAN and LIN plus control and driver signals. With 256 MS deep buffer memory and PicoScope 6 software you can capture and decode many packets to correlate data errors with signal integrity problems in a device under test. Make a vibration monitoring and analysis system. Just add an accelerometer to turn the PicoScope 4824 into a multi-axis system for detecting problems in rotating machinery, drives and controls. Techimp is a world leader in electrical asset diagnostics. They recently supplied TenneT, a leading European electricity transmission system operator, with their Power Connection Monitoring System (PCMONS). PicoScope oscilloscopes are an integral part of this system. Figure 1: Indoor cabinet. PicoScope 6000 Series and 4824 devices, the core of the aqcuisition system, are highlighted, as is Techimp's trigger manager, propagating the trigger signal inside and outside the cabinet. The behavior of transients in high-voltage cables is a matter of concern, especially when overhead lines alternate with cable links. That’s why TenneT ordered Techimp’s PCMONS for their Randstad 380 kV Noordring Project. The PCMONS is a continuous permanent monitoring system capable of acquiring transients based on amplitude thresholds. The PCMONS acquires all parameters simultaneously each time a transient occurs, with a time stamp accuracy of 100 ns to allow correlation with events acquired from other systems. The PCMONS is installed over a 40 km high-voltage power network in the north of the Netherlands, distributed in eight units covering 13 locations and four substations. It is composed of sensors connected to cabinets hosting amplifiers, acquisition instruments from Pico Technology and the triggering logic. The cabinets are connected via fiber optic to one server for each unit, where the triggering signals are distributed and the data is collected and transmitted to the central unit. This is the central server where data is stored for visualization and analysis using the proprietary human/machine interface (HMI) software, Techimp TiSCADA. The PCMONS is responsible for acquiring, processing, archiving and presenting information concerning the power connection, and all functions defined are accessible to the user. The system is able to acquire continuous and impulsive voltages and currents, and raw partial discharge (PD) waveforms that are stored in the local servers. All inputs have an adjustable trigger level above which the recording is started. An event detected on one of the sensors triggers all other measurements inside the same unit. In particular, each input has a dedicated trigger, each trigger level is adjustable between zero and the maximum input level and trigger levels are adjustable from the HMI and remotely. The PCMONS records 1 s of data after the trigger for all inputs with frequencies below 1 MHz, or 20 ms of data for frequencies above 1 MHz. 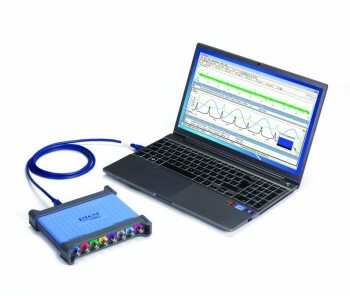 Each of the following parameters is measured thanks to the performance of PicoScope oscilloscopes, leveraging either the ability of the PicoScope 6000 Series to sample three channels at 500 MHz or the ability of the PicoScope 4824 oscilloscope to sample at 1 MHz on seven channels plus trigger. PicoScope represents a perfect solution, combining compact dimensions, accuracy and bandwidth with user friendliness. These instruments were installed on a similar system in 2013 and demonstrated no drift, granting perfect repeatability of the measurement. Voltage measurement using the high-voltage resistive-capacitive (RC) divider in a substation. Acquisition with a high sample rate, occurring only when the system is triggered. Hardware/software summation in order to provide the voltage on a particular line. Acquisition with a low sample rate, occurring continuously. Output in the form of an RMS voltage value over a period of time. Current measurement using the high-voltage current transformers (HVCTs) in a substation. Hardware/software summation of the various incoming and outgoing currents in a bus bar in order to provide the current through a particular line. Acquisition with a low sample rate, occurring continuously. Current measurement using Rogowski coils mounted at the terminations of each cable. Cable screen current passes through the outer sheath of each cable, measured using Rogowski coils installed on the grounding of the cable sheaths. Current measurement with a low sample rate. Acquisition occurs continuously. Output in the form of an RMS current value over a period of time. Measurement of partial discharge in the terminations at the connection between the overhead line and the underground cable, using the embedded sensors inside the terminations. Surge arrester current through the ground point of each surge arrester, measured using Rogowski coils installed on the groundings of the surge arresters. Surge arrester leakage current through the ground point of each surge arrester, measured using Rogowski coils installed on the groundings of the surge arresters. Voltage measurement using the voltage divider installed in each link box (i.e. the box connecting the high-voltage cable screens). Current measurement using Rogowski coils mounted on each intersection of the high-voltage cable screens. Measurement of partial discharge in the cable joints using the embedded sensors inside the joints at the joint bays. The HMI, based around Techimp’s proprietary TiSCADA software, gives to the customer the chance to access the full system, visualizing the waveforms and listing the events, location by location. Waveforms are organized as a collection of events in time. Each acquisition event is defined by the time of its occurrence and a scalar value that characterizes the waveform, so the visual representation of this collection is a trend graph. Figure 3: Schematic map of the units. Events are displayed by choosing the unit from a schematic map, and then the location from a diagram.